NEW #BATMAN TOYS From FISHER-PRICE!! Batman has always had the coolest tools and gadgets to fight crime in Gotham City – and his Batcave headquarters is no exception! 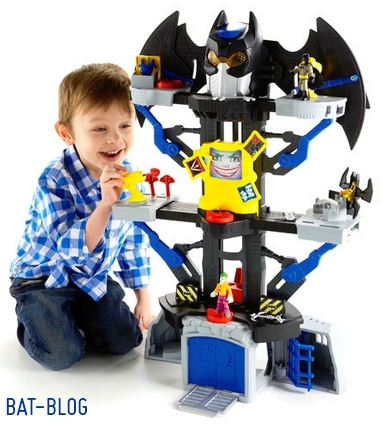 Turn a Power Pad to transform the Batcave – the platforms, Batcomputer and Batwings open and the eyes light up! Turn a second Power Pad to open the garage so Batman can speed off to thwart evil doings of THE JOKER! Turn a third Power Pad to open a chest with armor that Batman can wear to protect himself from enemy fire! And no Batcave would be complete without a jail, elevator and projectile launcher to add to the story and the adventures! Retails for around $60, for more info just CLICK HERE!